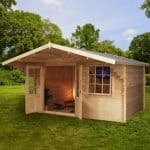 You will certainly get the wow factor with the Marlborough Log Cabin as it is a stylish, sumptuous looking cabin with enough space to entertain a small gathering or even just serve as a place for you to have a little privacy. Its incredible looking which would make a perfect extension to your living space. Ideal for some quiet time with a book and a cup of tea as well as entertaining, you could happily spend hours inside here. 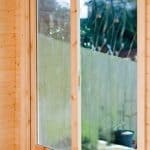 It has generous double doors with glass panels and a functioning window for light and air and is constructed out of strong, durable tongue and groove interlocking timber. This will make a real feature in any garden. With a 10 year anti rot guarantee it will last for a very long time. This product is home delivered and assembled for your convenience. From a design point of view this is one of the most interesting log cabins on the market. Tongue and groove boarding has been used for the roof and it looks incredible with these long eye catching beams. 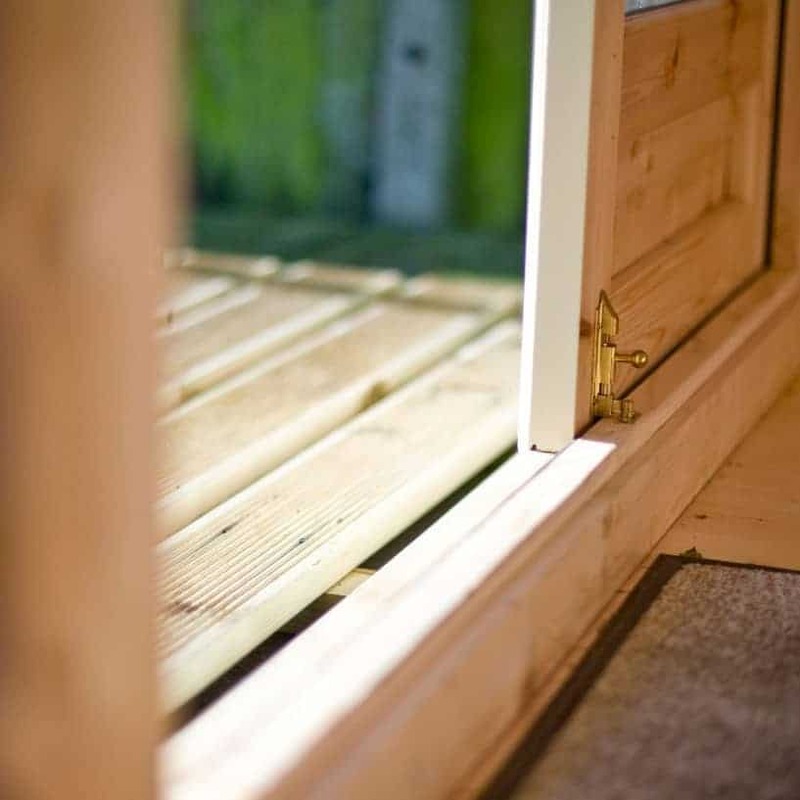 The flooring is also made with tongue and groove boards and at 15 mm thick, plus being supported with pressure treated floor joists, this is a floor which can take an incredible amount of weight. The Marlborough Log Cabin is the ultimate way to make sure you have your own little space on your property to relax after a hard day’s work or even just as a place to while away the weekend. This is just a gorgeous cabin that can be used for many different things and its tremendous look makes it something that is sure to get a lot of compliments from friends and family when they come over to visit. This is one of the most spectacular looking cabins we have seen and it really does have the look of something you would find deep in the woods. We love how spacious it is inside of here. The width is 9 feet 8 inches and the depth is the same, giving you a very nice amount of space to use so all the important things in life can fit inside, things like a sofa, dining table and a large screen TV. The headroom is a little over 8 feet along the ridge and even the eaves height is very respectable. The apex roof has a very striking looking to it. High quality felt covers these gorgeous tongue and groove boarding which you can see from the pictures really does have a high quality look. The beams used to keep the boarding up look fantastic and really help add to the charm of the whole cabin. While we really do love how amazing this roof looks on the outside and the inside. We must tell you that this roof is also going to be able to stand up to anything our weather can throw at it. The roof also has a little bit of an overhang along with a gutter, meaning the rain will not be running onto your head when you are trying to get in here with your drinks and snacks to watch the match. You can see just how lovely the log cabin looks and we really were amazed at just how attractive this cabin was. But the most amazing aspect of the cladding is that it is 28 mm thick. 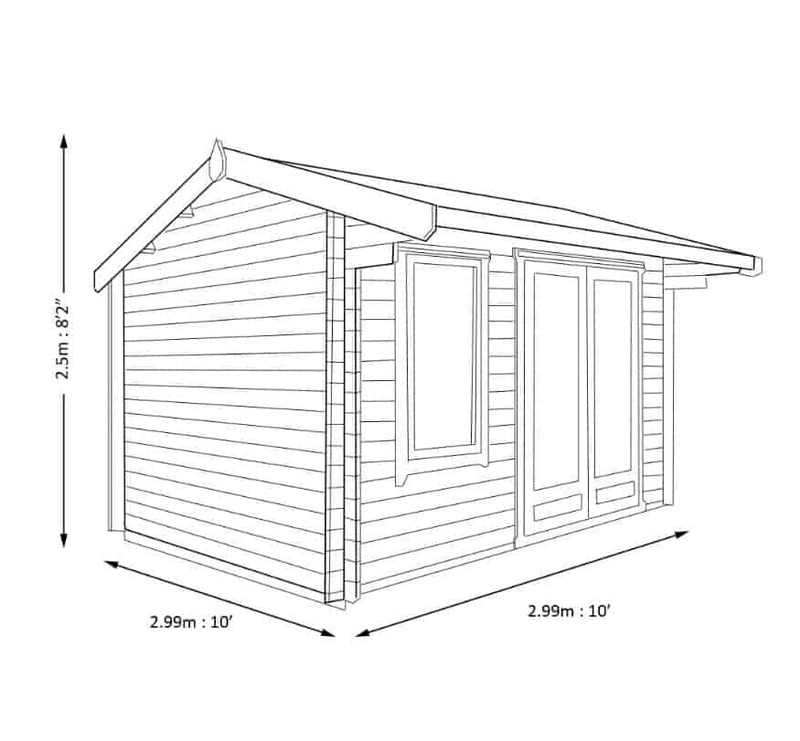 This is over double than what most over log cabins offer and it makes it one of the most strong and solid cabins we have ever seen. Tongue and groove cladding has been used and it has been used incredibly well, giving the cabin a real classy and high quality look. One of the most interesting aspects of this log cabin is the frame as there is no frame. Well not a frame in the traditional sense. You see with the cladding being so thick it also serves as the backbone of the whole log cabin. This takes away the need for framing to be sticking out inside the log cabin. This is a very interesting design choice and we must say, we just love how it makes the walls on the inside look so smooth. The flooring is something that is a step up from what other log cabins are offering as rather than be 10 or even 12 mm thick it is a solid, 15 mm thick. They have gone for tongue and groove flooring which gives the inside of the cabin a very uniformed look as it goes so well with the roof and the walls. The flooring is giving extra support thanks to the pressure treated floor joists which sit underneath it. 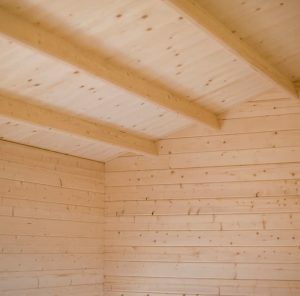 The Marlborough Log Cabin will be given a basecoat treatment, but a coating of wood treatment will need to be applied by you once you have installed it. This will keep rot and decay away and to be honest it really is not that big of a job. We must say that annual treatment is recommended to ensure the wood remains protected from rot for the duration of its life. 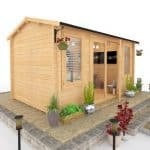 A generous ten year guarantee comes with this log cabin, but it being valid depends on you treating the wood. So do not keep putting off treating the cabin until next weekend or you will not be covered. A good sized double door is included and we just love the look of it. The door has a lovely design and is made with some toughened glass which goes really well with the door frame. These doors can be opened independently which is a nice touch, but when you are putting your items in the cabin, you can open them both up, giving yourself a lot of room to get larger items inside. There is only one window on the cabin which let us tell you is a well made window that can be opened so you can let fresh air into the cabin, but as great as this is we would have loved to have seen another one on the side of the cabin, especially at the price they are asking. 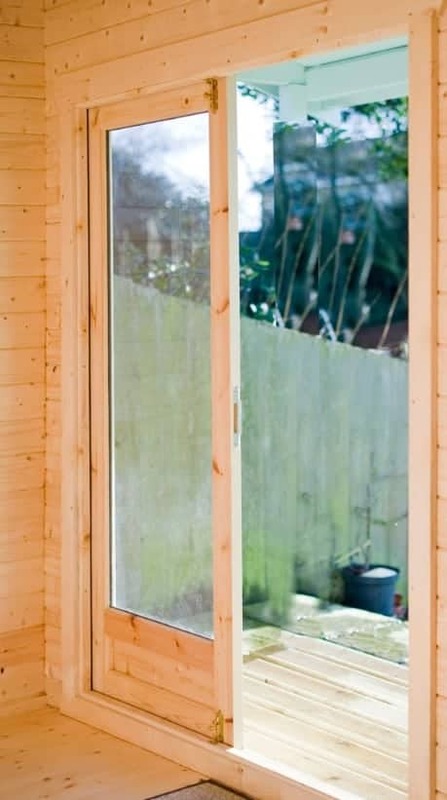 The window is made with that same high quality toughened glass and lovely looking framing of the door. If you look closely at the door handle you will see that there is an actual lock on it. We think that all log cabins and summerhouses should come with some kind of locking mechanism so we were very pleased to see that this one has a lock as standard. This will make you feel more comfortable having expensive items inside of here such as a TV, computer or if you are lucky and your other half does not mind, a full size pinball machine. Despite its large size this is actually a pretty private log cabin. While we would have liked to have seen at least one more window on here, the fact that only one side of the cabin has windows means that it is not all that easy to have a sneaky look inside of here. When the people are installing the cabin they will actually give you the choice of what side you want the doors and the windows to be on. Also another way to customise the cabin is with the wood treatment. You could make that lovely looking wood a little bit darker or lighter if you prefer. Apart from this there is not actually anything you can do to change the look, but honestly this looks so fantastic as it is, we would be shocked if anyone did want to change its appearance. No extras are being offered with this log cabin which we are happy about. There is an assembly service, but it is actually included with the price. 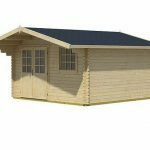 This is one of the highest quality log cabins we have ever seen the walls are so thick that there is no need for a standard frame and the roof and floor are made with thick and long lasting tongue and groove boarding. They have designed this log cabin to last many, many years which are certain they will. Plus as long as you treat the wood it is going to stay rot free and smooth looking for lots of years. 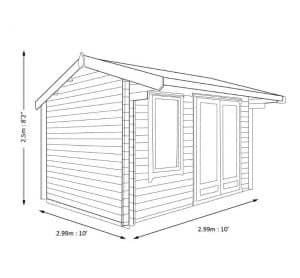 The 10 x 10 size of this cabin makes it something which can be used for pretty much anything you want. We have seen larger cabins, but this one offers you lots of space and may even be able to fit in gardens that are a little bit compact in their size. An assembly service is included so sit back with your feet up while they do all the work. Yeah so this is one of the more expensive log cabins we have seen, but we feel that the high price is actually justified considering how incredible this looks and the high quality materials used. 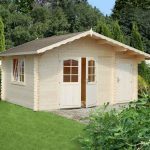 Final Thoughts: The Marlborough Log Cabin is a very high end type of cabin and that is why it is priced the way that it is. 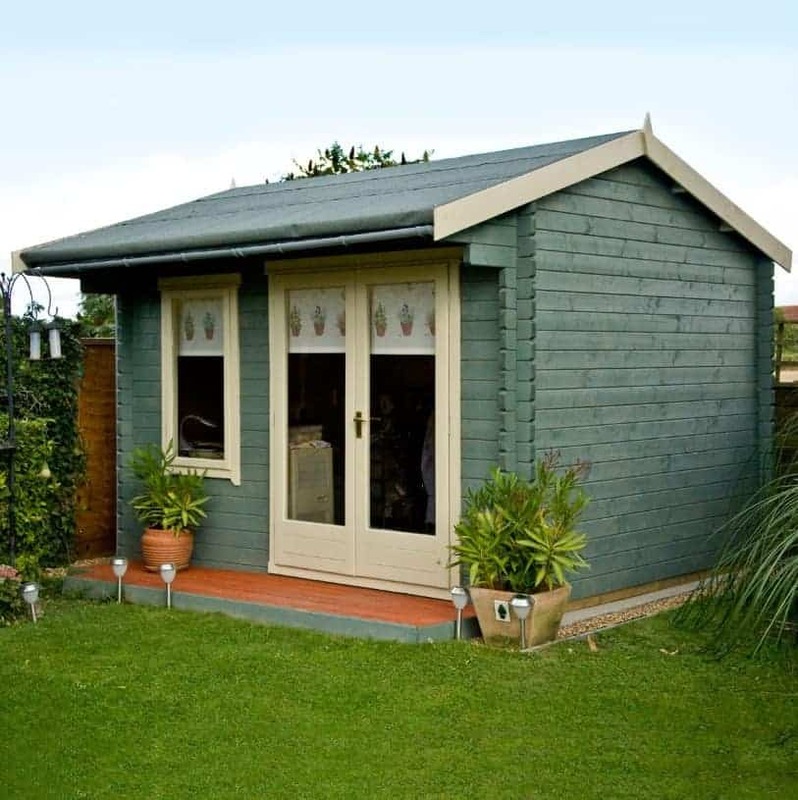 This is first class all the way and it is something which we feel would be purchased instead of adding an extension or even a small conservatory to your home. It clearly has an incredible look and the materials used in its construction are some of the best we have ever seen. So when you take all that into account the price is actually very fair, especially considering it includes the assembly service. 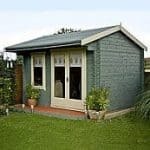 If you want to buy a cabin that is going to be something you get many years of use out of and be a real asset to your home then this one here is perfect, even if you do have to save up for quite a while to get it. The size of this summer house was perfect for what I needed it for. I just wanted to have a few friends over sometimes and have a nice place to go and catch up and visit. I also use it for a little office away from my home. I work from home and sometimes it can be quite distracting to work inside the home from the family making noise the phone ringing, the animals, etc. However, with this summerhouse, I can get away and get work done. There is natural light because of the nice windows. There is a door and everything to make it feel like a real, small house. I like it a lot and like how secure it is. It seems to be insulated half way decent. I am glad I jumped on this summer house. My wife even likes to go out there when she needs to get away. It’s nice to have a get-away spot in our backyard. No complaints here. This Shire Marloborough Log Cabin is so stylish. It is a 10X10 so it is spacious enough for my wife and I to relax in. I got it so we can hang out in there and relax on the weekends. My wife has always wanted an outdoor cabin like this. It was home delivered and has a 10 year anti rot guarantee. I instantly bought this cabin when I seen it. It was perfect. It is almost the same color as my house, so I Thought it would look great with my house. It was a little getaway in my back yard. It’s nice because my shudders are white on my house too, so it matches perfectly. I like decorating the outside of it. I also love how the roof kind of slant over the door so the rain just falls down.